Still a ways out from the season, but some not so promising news out of the NLL today. Hopefully they get a deal done, but the NLL and the PLPA to a lesser extent need to recognize they are far from a top tier league and cancelling part or all of a season will lose them fans that will be hard to win back. I'm mostly on the side of the players in this case, some of the salaries are minuscule. It would be sad if they lost games or a season. Really in this type of league the players and the owners need to truly work together or else it will die. is the PLL the problem? Maybe, but that is a different sport. I went to a MLL game a couple of years ago, IMO, it was an inferior product/game to NLL. I don't think they are part of the equation but I might be wrong. Rabil is a special talent of that here is no doubt. Box really isn't played much in the states. Some pro box players are signed up for PLL (Dickson, Bell), but the seasons shouldn't overlap. Regular season NLL is done April 20 and PLL starts June 1. I think they can squeeze in NLL playoffs without overlap, not 100% sure. PLL is more of a threat to MLL, which is the established field lacrosse league in the US. My kids play, and to be honest I like watching the field game more. But it is not nearly as approachable as box for new fans. And field is what is played at the NCAA level in the US, so it has a lead in popularity in the States. Field is being played more at the university level in Canada but not to the same extent. Saw a comment on Twitter that because negotiations are ongoing they are not holding to the 5:00 pm deadline today. Hopefully they get this done. No news as of yet, which I view as a good thing as it means they are likely actively talking. These games are great for the skill and speed of the game, but also price point. To my mind it is the full package. Last edited by undercoverbrother; 11-15-2018 at 01:34 PM. With only cancelling first two weeks so far, Roughnecks haven't lost any home games yet. Home opener is Dec 15. Suspect it will be another 2 weeks canceled. The players are being really stupid on this one and I say this as someone who will mostly side with players in most contract/CBA negotiations. 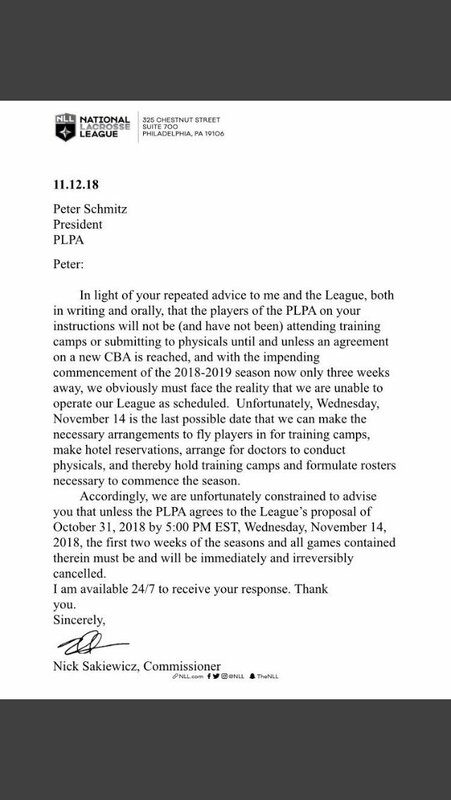 You're a development league, if they don't be careful there won't be a league at all. Theres like 4 teams that are above water, rest are folding/moving. This isn't a league where owners are raking in the money. Whatever the players may gain will likely be gone when/if they reach a deal and couple teams announce they are folding and there are 40 less roster spots. Are the Flames/Canucks/Sabres owners going to care if their lacrosse teams fold? I highly doubt it. Couple of those teams are the most stable teams in the league. Think about that players and PA. I have to be careful about commenting about all this as I'm employed by the league. There is a lot of good information out there. Indeed the finances of the league are quite variable which makes this challenging. There is a very difficult economic state if you look at Colorado, Calgary, Toronto and Saskatoon relative to other teams. But really what the core disagreement about is how will the players be able to participate in the growth of the league. How is that growth measured and defined. That at the core, from what I understand, is the biggest point of contention and what is in the way. I really hope it is resolved. Going to games with my boy is a joy. Roughnecks just sent out a STH email cancelling the November 24 pre-season game but holding out hope that the home opener on December 15 is still a go. Chatter on Twitter (mainly Jake Elliot) is that a deal is imminent with no further games cancelled. Here's hoping.